The temperatures will collapse tomorrow and last, being able to register of maximum on Sunday until 10ÂºC less than today. The minima will also fall, with the decrease being more moderate due to the effect of clouds and wind. But both maximum and minimum will be well below the average climatic values â€‹â€‹for these dates, being more typical of a month of December than the end of October. This entrance of cold air will not be very humid in the Region of Murcia, although some weak precipitation will be recorded on Saturday morning from noon, especially in the afternoon / evening, when some showers may fall, more likely in the middle east region of. On Sunday, some weak and isolated rainfall will be recorded, more likely in areas of the west and in the interior of the Region. The snow could cope timidly in the mountains of Moratalla and Caravaca. In case of precipitation on Sunday in Sierra Espuña, it would also be in the form of snow on the peaks, but it would be anecdotal. The wind will help to increase the feeling of cold. At the moment there are no warnings triggered by this phenomenon, but it could blow with strong gusts from late afternoon in high areas and the coast, and more moderate in the rest. Caution if you move to mountain areas. 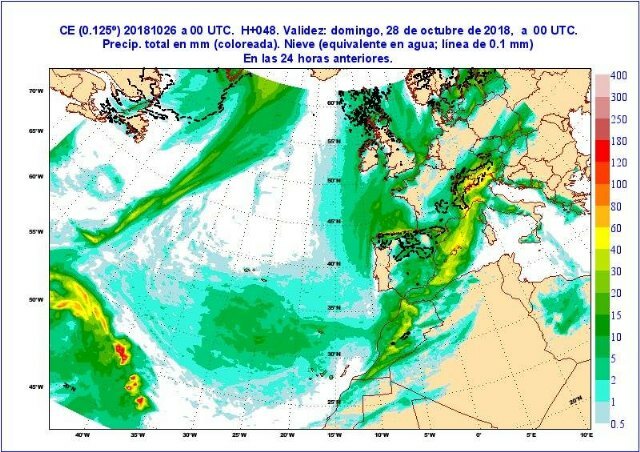 As for the rest of Spain, rainfall will be widespread and snow will appear in all mountain systems, even in flat areas of Castilla y León. The wind will be strong in some areas and the temperatures will drop significantly. A lot of caution if you travel on mountain roads in the northern half. Next week will start with similar time. It's time to take off the coat.